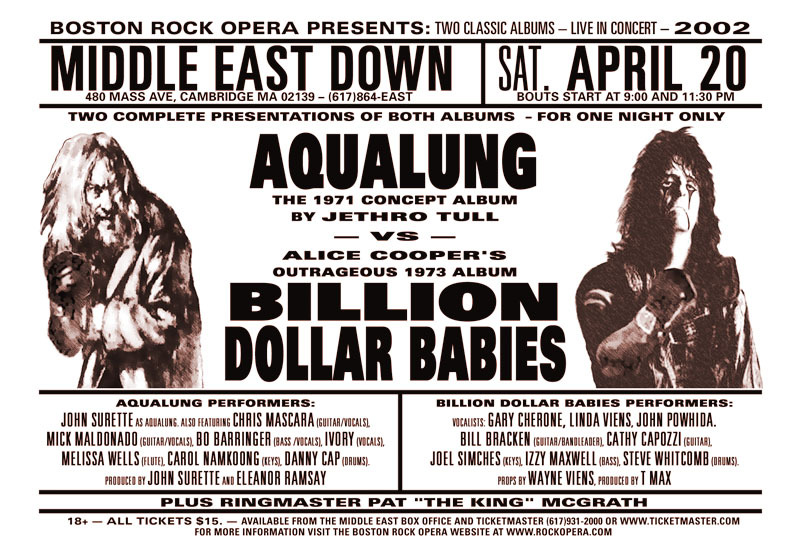 Boston — Boston Rock Opera will present original stagings of the classic rock albums Aqualung (by Jethro Tull) and Billion Dollar Babies (by Alice Cooper) Saturday, April 20, 2002 at the Middle East Downstairs. The two performances, which will be presented back to back twice during the evening at 9pm and then again at 11pm, are the first of what we hope will be a continuing series celebrating “important” albums in the history of rock and roll. Aqualung features John Surette in the title role with Mick Maldonado, Chris Mascara, Bo Barringer, Melissa Wells (on flute), Carol Namkoong and BRO newcomers Ivory and Danny Cap (from The Electrolytes). The 1971 concept album, peppered with equal parts schizophrenia, religious angst and lust, is considered by many to be Jethro Tull’s quintessential work. It contains the classic hard rock hits “Aqualung,” “Cross-Eyed Mary” and “Locomotive Breath” as well as the suite of religious themed songs (“My God,” “Hymn 43,” “Wind-up”) interspersed with beautiful acoustic interludes. The album will be presented theatrically. Billion Dollar Babies features Gary Cherone, Linda Viens and John Powhida (a BRO newcomer, from The Rudds) on vocals backed by a band comprised of Bill Bracken, Cathy Capozzi, Izzy Maxwell, Joel Simches and Steve Whitcomb, all whom have previously performed with BRO. Artist Wayne Viens will design props especially for the show. Alice Cooper’s hard-rocking 1973 album — part cynical portrait of America at the height of the Nixon-era, part twisted camp — is still both shocking and funny. It features hits such as “Elected” and “No More Mr. Nice Guy” as well as the lesser known mini-opera “Unfinished Sweet” (about a bad day at the dentist). While the competitive aspect of the night is primarily for fun, the two groups are determined to up-stage one another so the evening promises to deliver over-the-top versions of both works. Pat McGrath will be the MC. The event is co-produced by Eleanor Ramsay and T Max. Posted in BRO Shows and tagged AvsB$B.